Player safety is touted by sports field managers as their first priority. Player injuries can be acute or chronic; respective examples would be spraining an ankle vs. shin splints. The chance for both types of injuries is increased by a surface which is too hard. Surface hardness is the amount of energy returned to an object (a ball, or part of an athlete’s body) when it strikes the ground. Hardness is measured in Gmax, a unit which describes how quickly an object decelerates on impact. You can visualize this deceleration measurement in terms of extremes- if you jump onto a soft couch, you will land gradually because the cushion will absorb most of your kinetic energy. On the other hand, if you dive onto a tile floor, your downward motion will be stopped very quickly since the floor returns most of the energy to your body (ouch!). 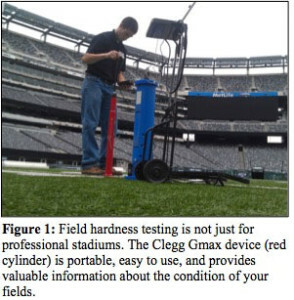 The standard device for measuring Gmax on natural grass sports fields is the Clegg Impact Hammer. This device is easy to use and can be purchased by facility managers who wish to monitor field hardness. High Gmax on a sports field can lead to injuries. In the NFL’s field testing program, all fields must register below 100 Gmax to be considered safe. The second variable in field hardness is soil water content. On fields with irrigation, soil moisture can be somewhat controlled. On non-irrigated fields, the soil becomes harder as it dries out. By increasing the soil’s pore space with aeration and compost topdressing, more water will infiltrate during rain events and will remain in the soil during dry spells. You may be surprised that we didn’t name the grass itself as a variable affecting field hardness. Indeed, the grass plants on their own don’t play a big role, but their influence on the soil is very important. 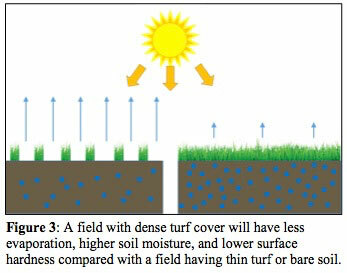 Simply maintaining good turf cover goes a long way toward keeping field hardness at the right level. Bare soil is more apt to dry out and become hard. A great example is a baseball or softball field on the day following a rain. The skin portion of the field will usually dry out quickly and become very hard unless more water is applied. Conversely, the grass areas will retain some moisture and have a more forgiving feel underfoot. This is because the grass shields the soil from the sun and reduces evaporation. Practices which encourage healthy grass- such as frequent mowing, a cutting height between 2-3,” and adequate fertilization- will help minimize surface hardness by maintaining the turf cover. Natural grass and synthetic turf fields will both become harder over time without proper maintenance. The reasons for each field type’s increased hardness are different. On a natural grass field, hardness is mostly related to the soil underneath- namely, the compaction level and the moisture content. It is intuitive to most people that compacted soil is harder. This can be explained by soil science, too. On a microscopic level, the soil particles in a compacted field are so close together that they can’t be displaced very easily, and they don’t dissipate much energy. Soil compaction can be relieved with core aeration, which should be performed several times per year on a high-traffic field. 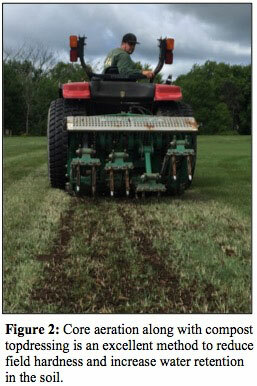 An excellent way to reduce future compaction is to incorporate compost topdressing as part of the aeration process. The organic matter in the compost will help build soil structure and reduce soil density.